With Thanksgiving just 11 days away cranberries are in abundance. Plus if you’re living in Missouri you know the weather has been unseasonably warm. Yet tonight a storm is apparently moving in and will bring buckets of rain over the next 5 days and a drop in the temperature. 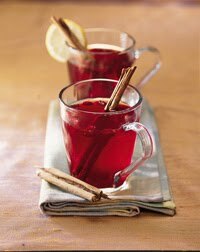 So if you’re looking for something to warm your inners on those chilly rainy days or looking for that special beverage for Thanksgiving Day try this Cranberry Tea. I think it tastes great. If it’s still warm in your neck of the woods just put it on the rocks and have an Iced Cranberry Tea. Combine and boil 7 minutes until the sugar dissolves. Wash berries. Boil until all berries pop. When the berries pop, boil 5 minutes longer. Drain off cranberry juice. Mix juice, simple syrup, orange juice, lemon juice and cinnamon sticks. Serve hot. May be garnished with a cinnamon stick and slice of an orange. May be stored in the refrigerator for several weeks. It is. I hope you’ll try it.